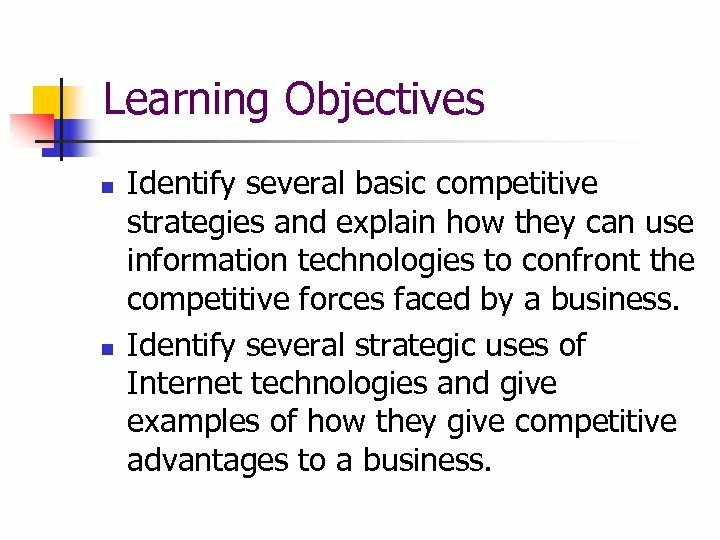 Learning Objectives n n Identify several basic competitive strategies and explain how they can use information technologies to confront the competitive forces faced by a business. 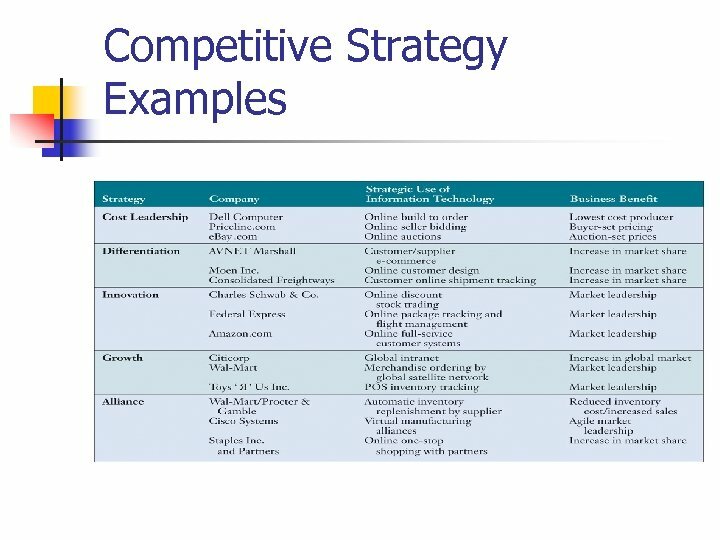 Identify several strategic uses of Internet technologies and give examples of how they give competitive advantages to a business. 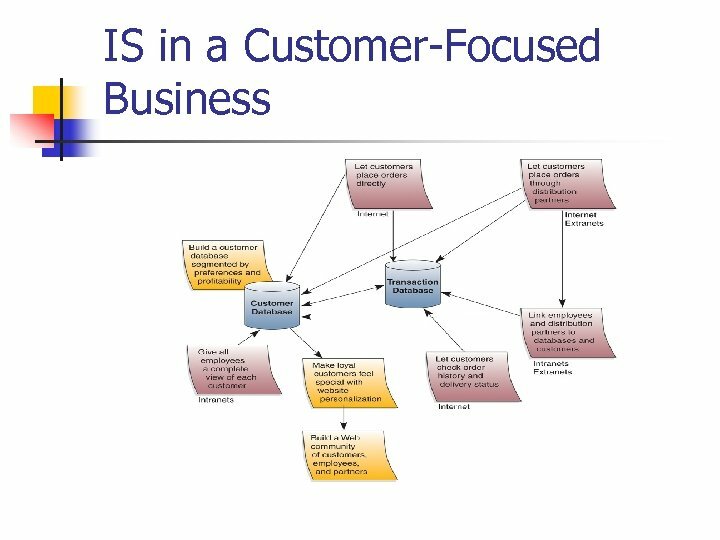 Learning Objectives n n n Give examples of how business process reengineering frequently involves the strategic use of Internet technologies. 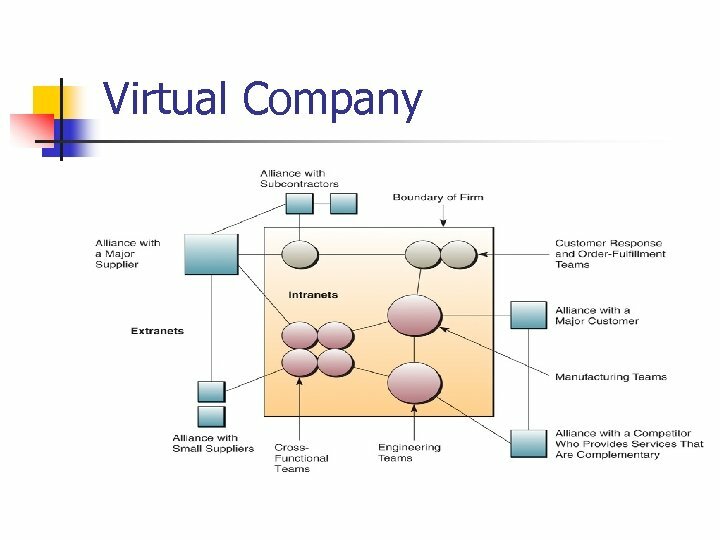 Identify the business value of using Internet technologies to become an agile competitor or to form a virtual company Explain how knowledge management systems can help a business gain strategic advantages. 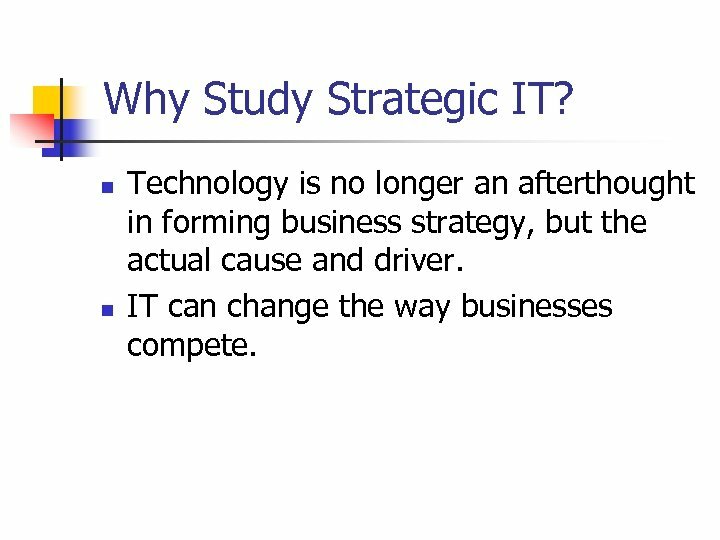 Why Study Strategic IT? 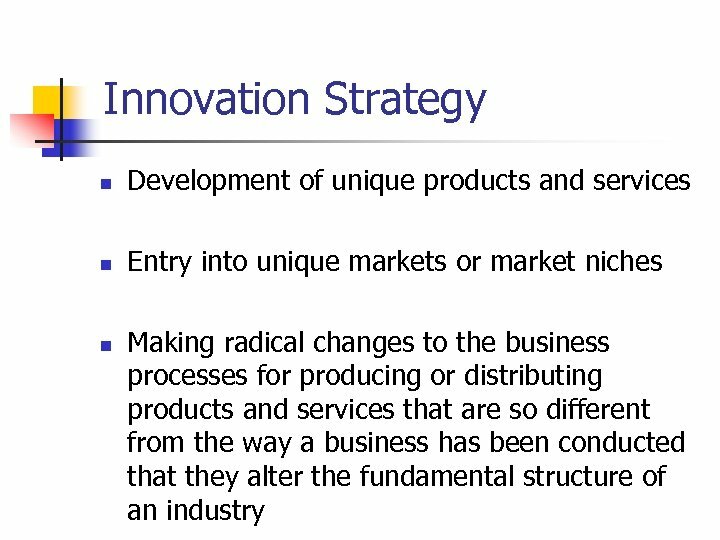 n n Technology is no longer an afterthought in forming business strategy, but the actual cause and driver. 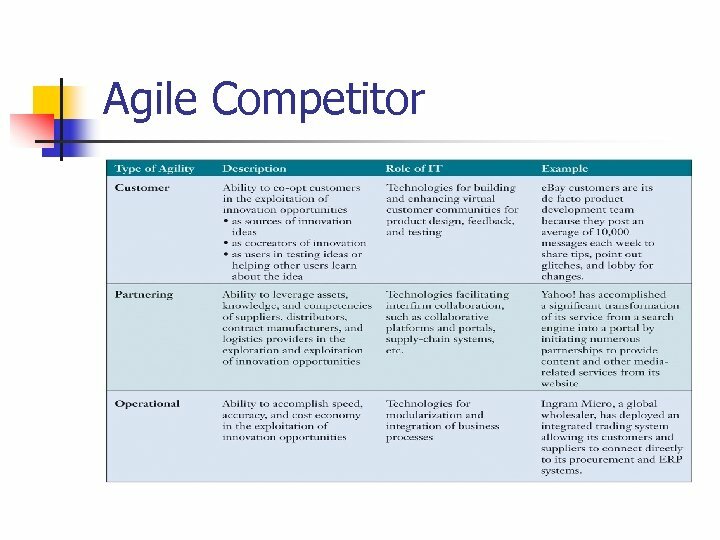 IT can change the way businesses compete. 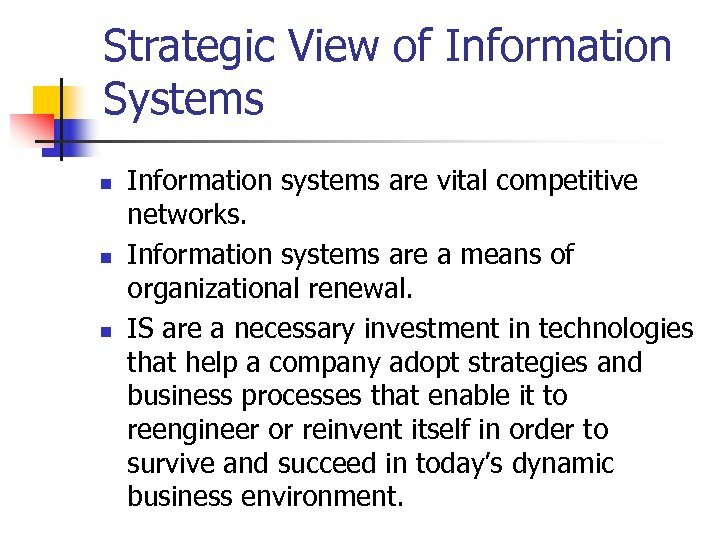 Strategic View of Information Systems n n n Information systems are vital competitive networks. 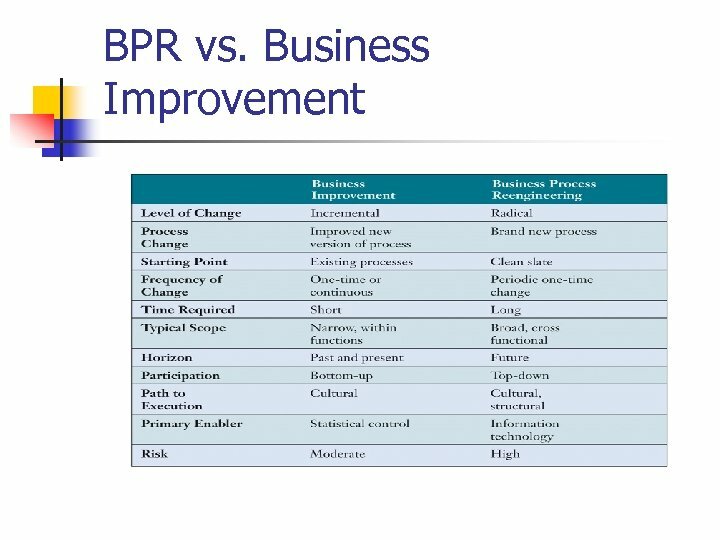 Information systems are a means of organizational renewal. IS are a necessary investment in technologies that help a company adopt strategies and business processes that enable it to reengineer or reinvent itself in order to survive and succeed in today’s dynamic business environment. Case #1: Does IT Matter? 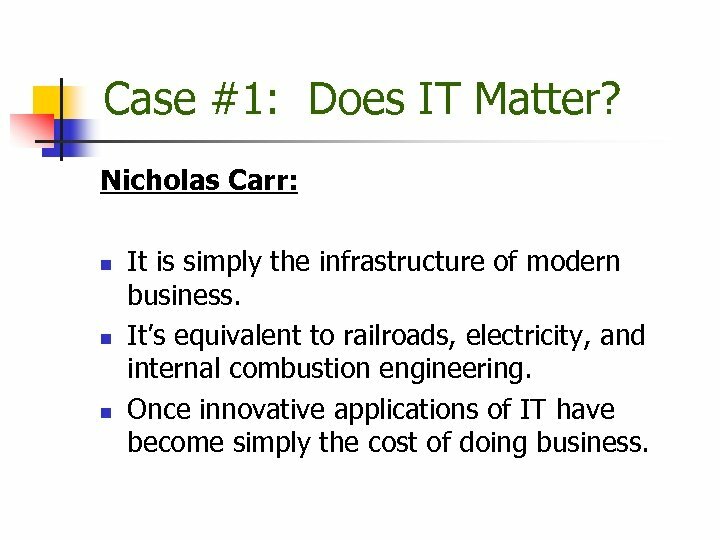 Nicholas Carr: n n n It is simply the infrastructure of modern business. 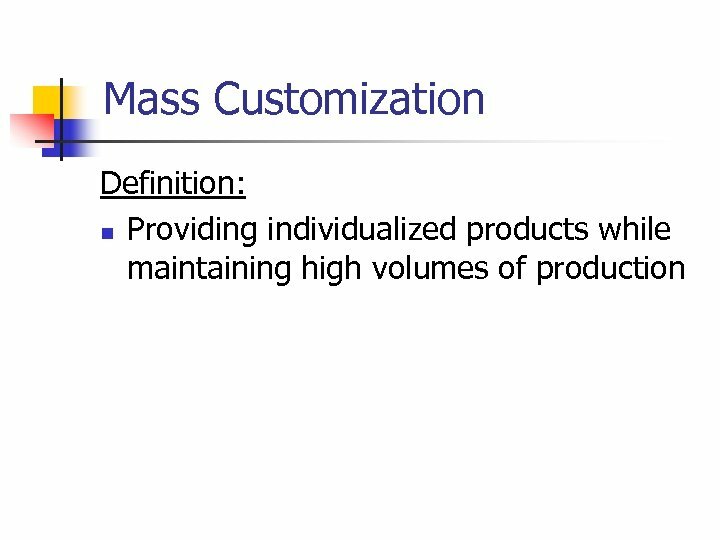 It’s equivalent to railroads, electricity, and internal combustion engineering. 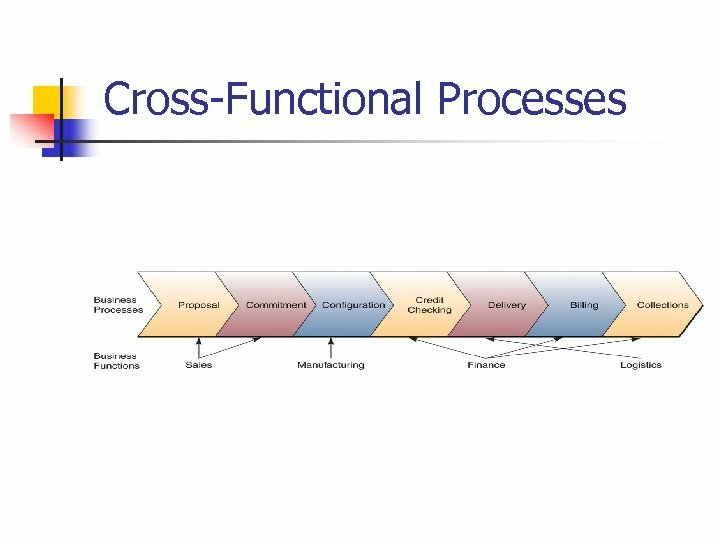 Once innovative applications of IT have become simply the cost of doing business. Case #1: Does IT Matter? 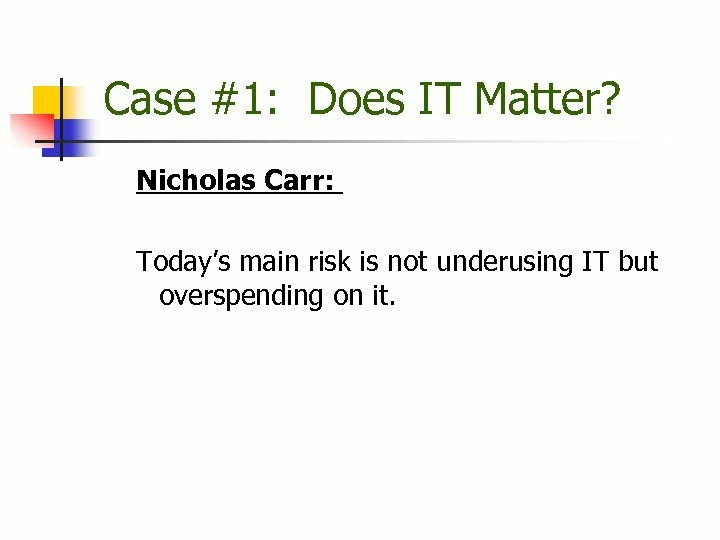 Nicholas Carr: Today’s main risk is not underusing IT but overspending on it. 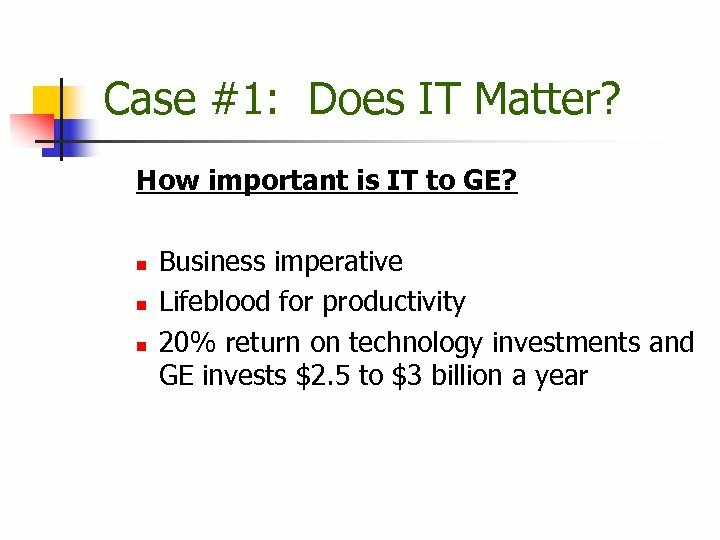 Case #1: Does IT Matter? 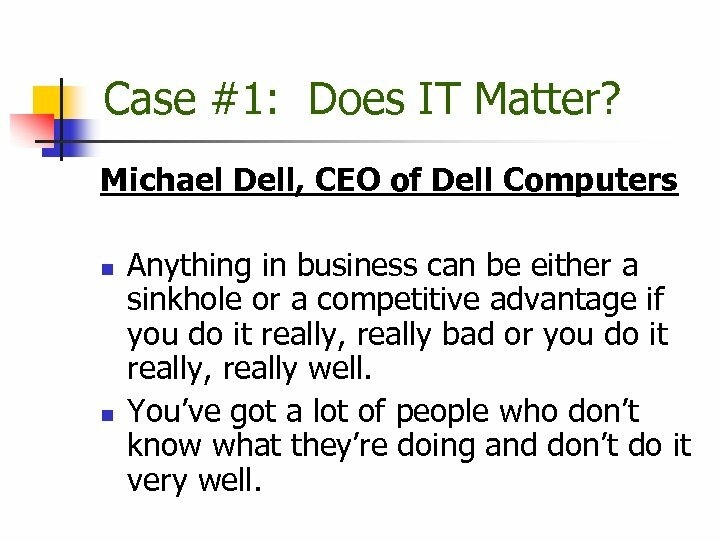 Michael Dell, CEO of Dell Computers n n Anything in business can be either a sinkhole or a competitive advantage if you do it really, really bad or you do it really, really well. You’ve got a lot of people who don’t know what they’re doing and don’t do it very well. 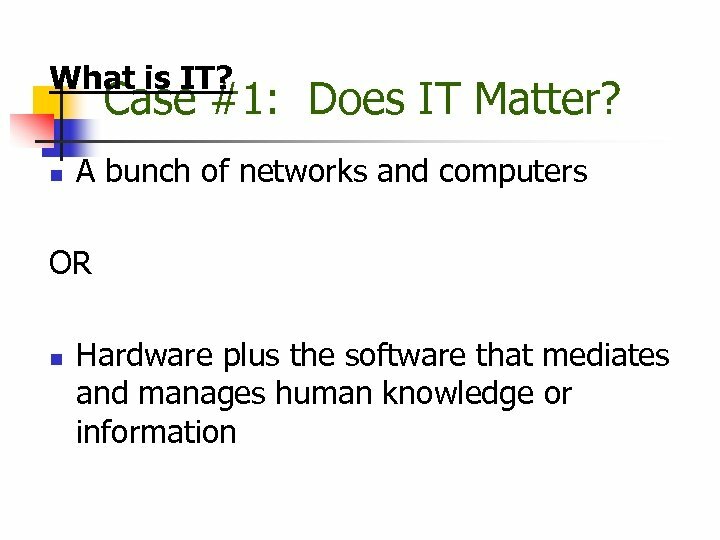 Case #1: Does IT Matter? 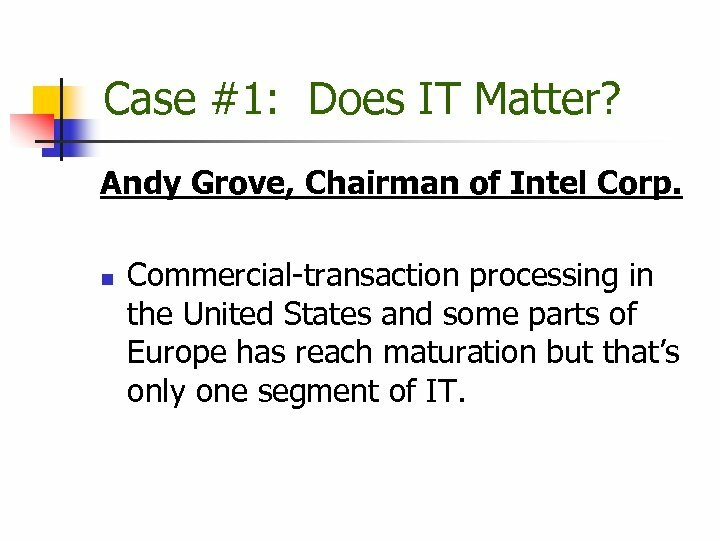 Andy Grove, Chairman of Intel Corp. n Commercial-transaction processing in the United States and some parts of Europe has reach maturation but that’s only one segment of IT. Case #1: Does IT Matter? 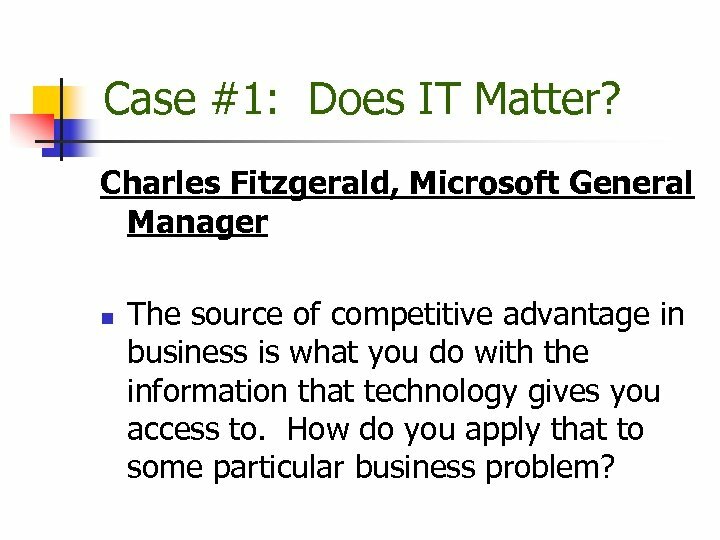 Charles Fitzgerald, Microsoft General Manager n The source of competitive advantage in business is what you do with the information that technology gives you access to. How do you apply that to some particular business problem? 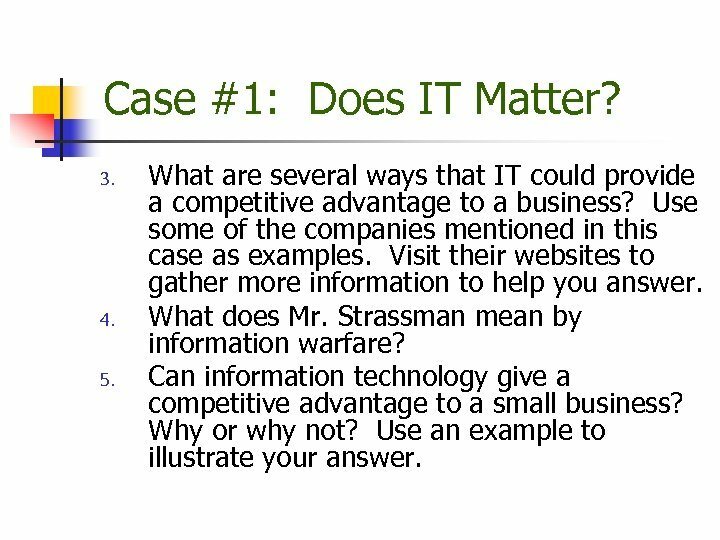 Case #1: Does IT Matter? 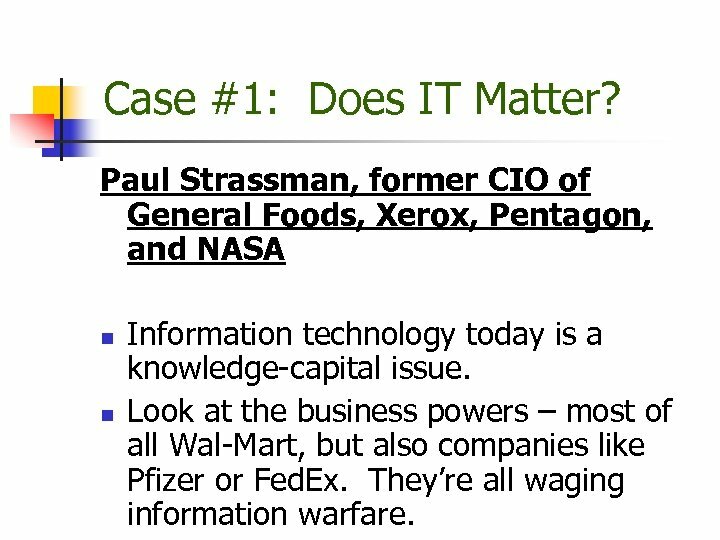 Paul Strassman, former CIO of General Foods, Xerox, Pentagon, and NASA n n Information technology today is a knowledge-capital issue. Look at the business powers – most of all Wal-Mart, but also companies like Pfizer or Fed. Ex. They’re all waging information warfare. Case #1: Does IT Matter? 1. 2. 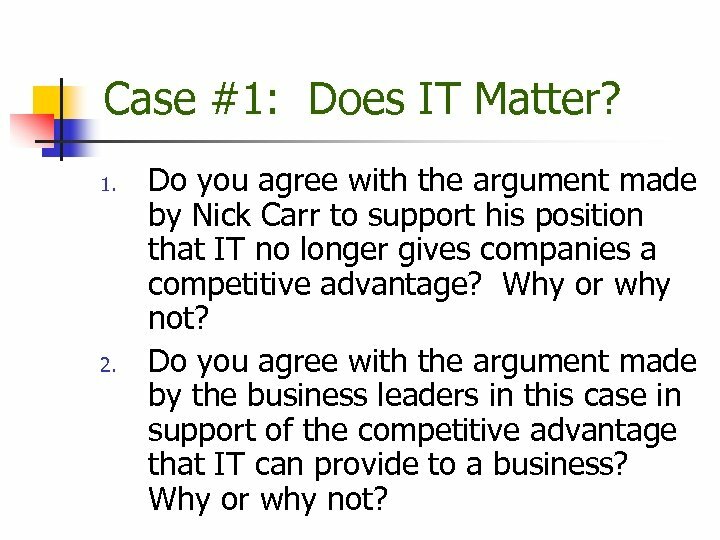 Do you agree with the argument made by Nick Carr to support his position that IT no longer gives companies a competitive advantage? Why or why not? 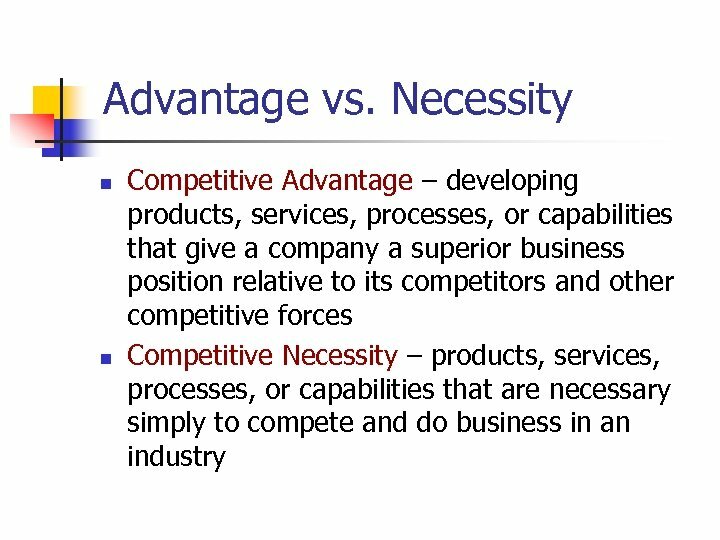 Do you agree with the argument made by the business leaders in this case in support of the competitive advantage that IT can provide to a business? Why or why not? Case #1: Does IT Matter? 3. 4. 5. 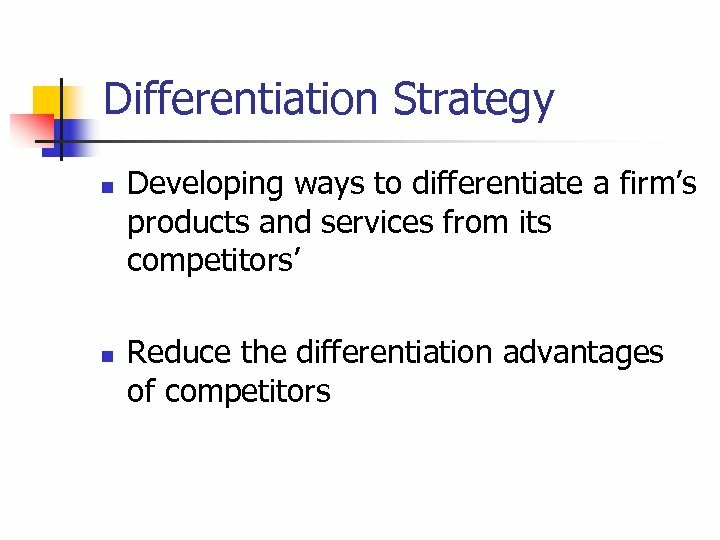 What are several ways that IT could provide a competitive advantage to a business? Use some of the companies mentioned in this case as examples. Visit their websites to gather more information to help you answer. What does Mr. Strassman mean by information warfare? 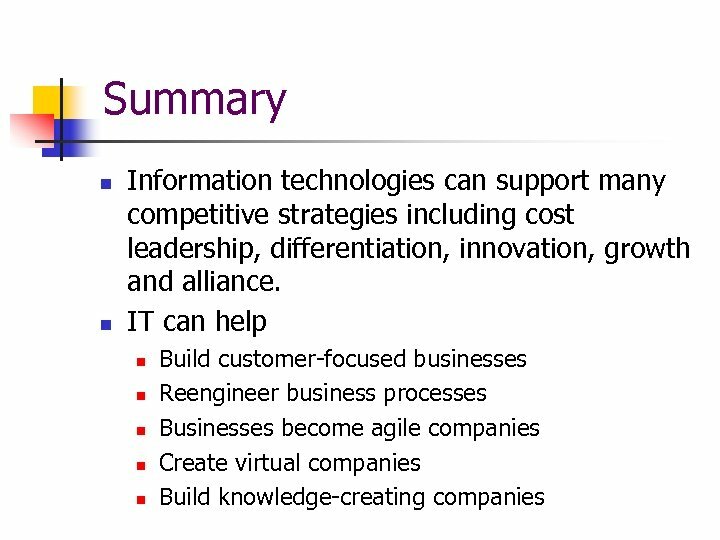 Can information technology give a competitive advantage to a small business? Why or why not? Use an example to illustrate your answer. 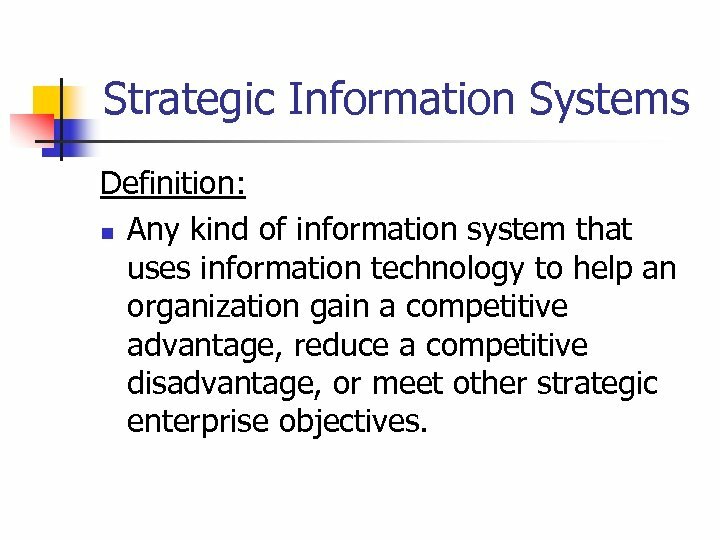 Strategic Information Systems Definition: n Any kind of information system that uses information technology to help an organization gain a competitive advantage, reduce a competitive disadvantage, or meet other strategic enterprise objectives. 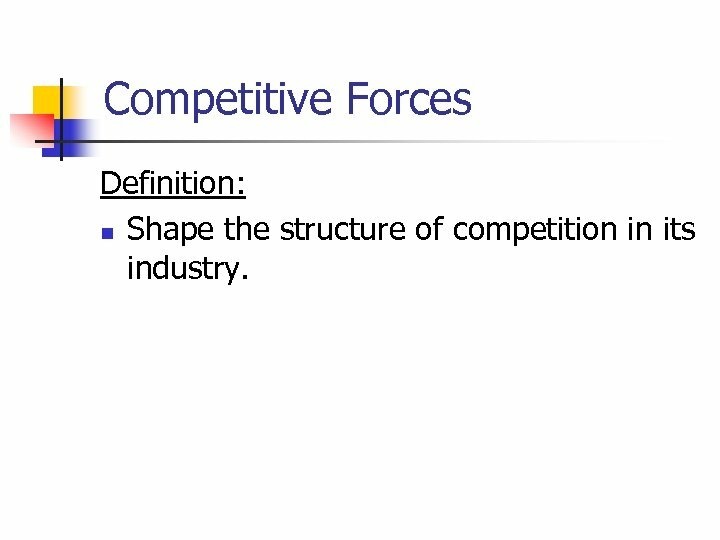 Competitive Forces Definition: n Shape the structure of competition in its industry. 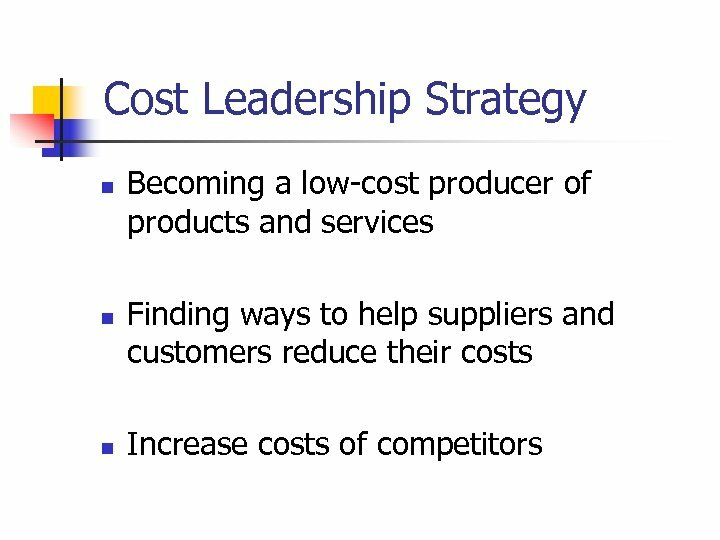 Other Competitive Strategies n n Locking in customers or suppliers by building valuable new relationships with them. 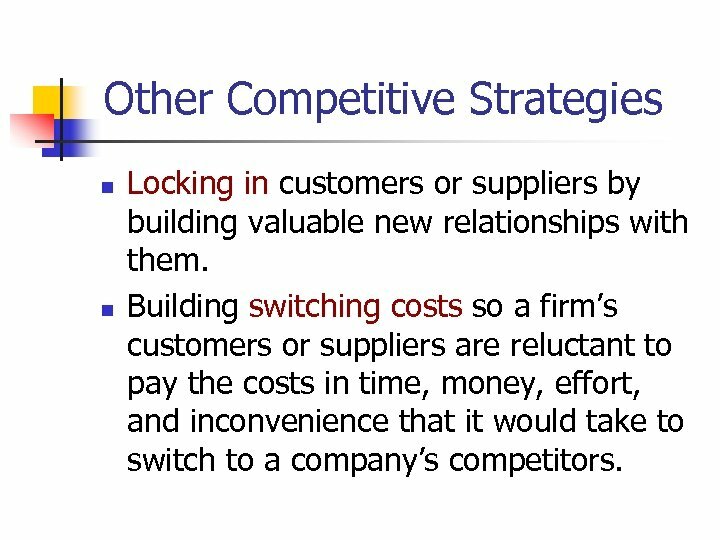 Building switching costs so a firm’s customers or suppliers are reluctant to pay the costs in time, money, effort, and inconvenience that it would take to switch to a company’s competitors. 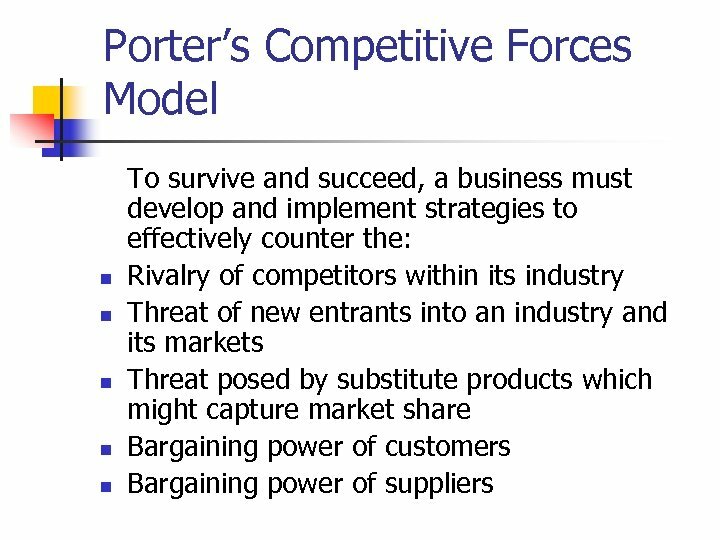 Other Competitive Strategies n n Raising barriers to entry that would discourage or delay other companies from entering a market. 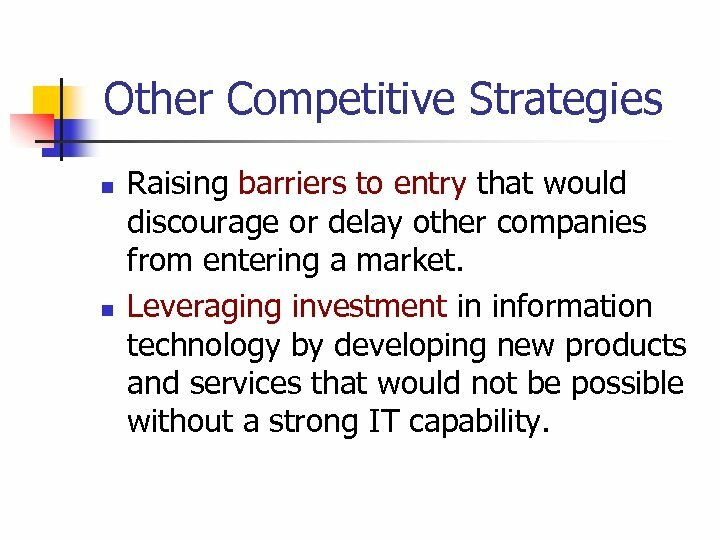 Leveraging investment in information technology by developing new products and services that would not be possible without a strong IT capability. 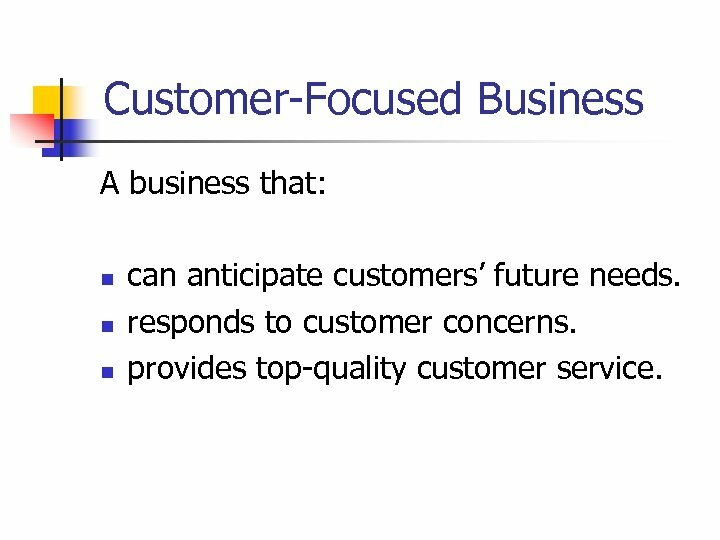 Customer-Focused Business A business that: n n n can anticipate customers’ future needs. responds to customer concerns. provides top-quality customer service. 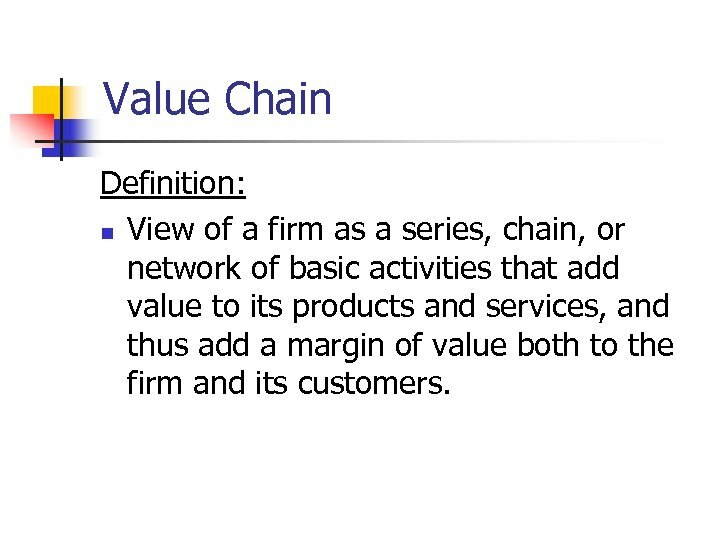 Value Chain Definition: n View of a firm as a series, chain, or network of basic activities that add value to its products and services, and thus add a margin of value both to the firm and its customers. Case #2: Using IT to tap Expert Know-How 1. 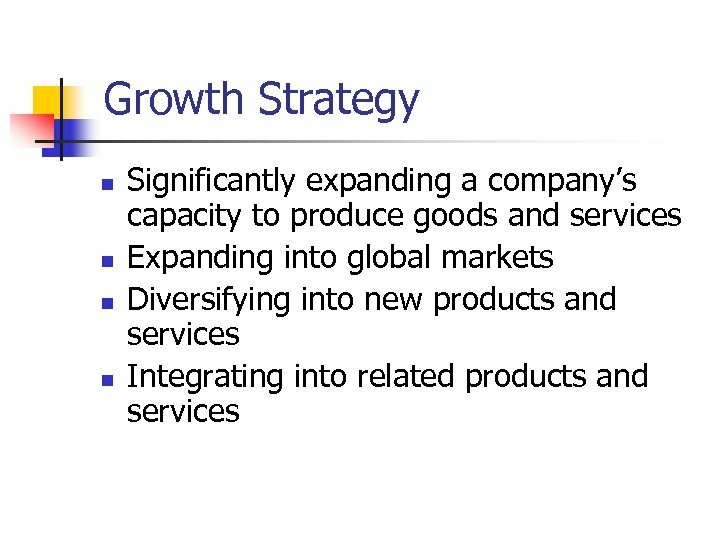 What are the key business challenges facing companies in supporting their global marketing and expansion efforts? How is the Ask. 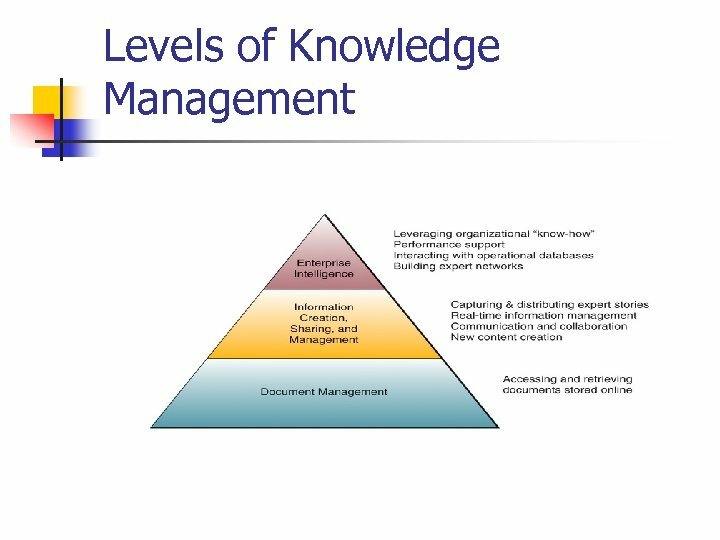 Me knowledge management system helping to meet this challenge? Explain. 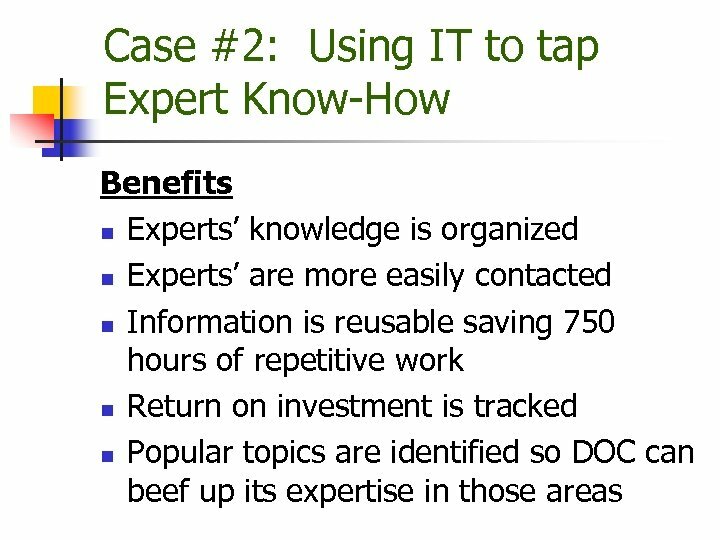 Case #2: Using IT to tap Expert Know-How 2. 3. How can the Ask. 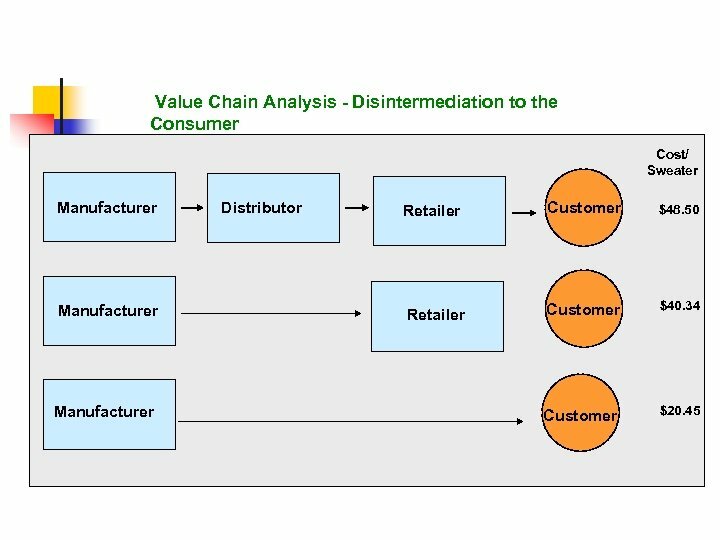 Me system help to identify weaknesses in global business knowledge within the Department of Commerce? What other global trade situations could the Ask. Me system provide information about? Provide some examples. Case #2: Using IT to tap Expert Know-How 4. Is the Ask. 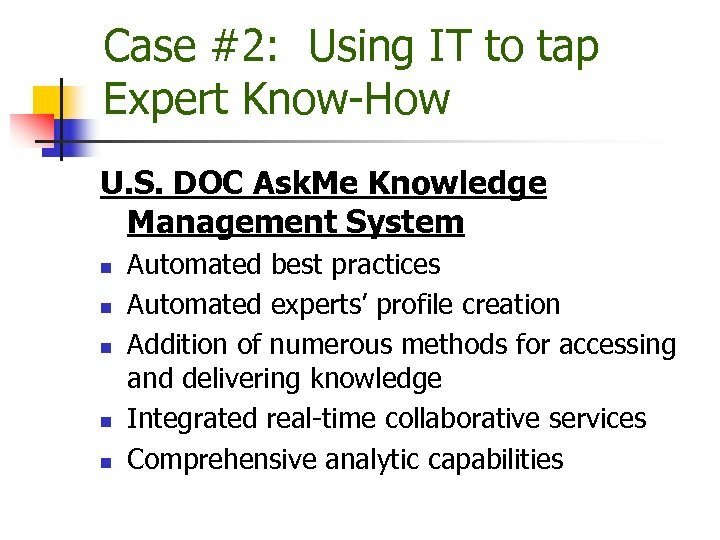 Me system intended to help the DOC become a knowledgecreating organization? Why or why not? 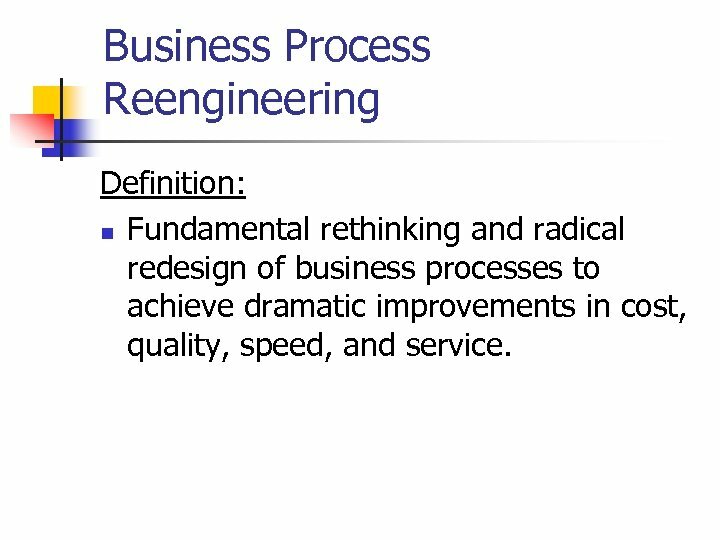 Business Process Reengineering Definition: n Fundamental rethinking and radical redesign of business processes to achieve dramatic improvements in cost, quality, speed, and service. 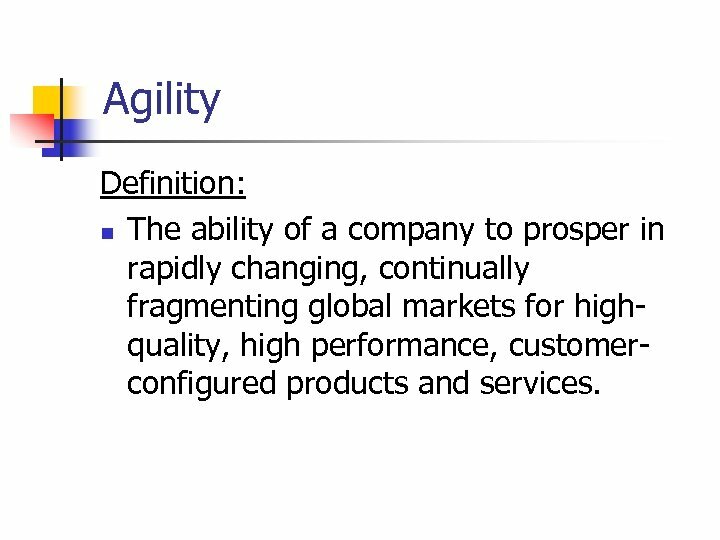 Agility Definition: n The ability of a company to prosper in rapidly changing, continually fragmenting global markets for highquality, high performance, customerconfigured products and services. 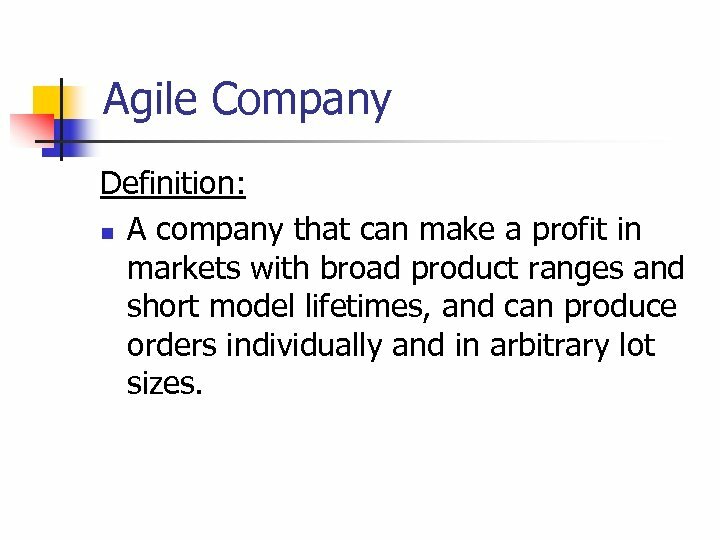 Agile Company Definition: n A company that can make a profit in markets with broad product ranges and short model lifetimes, and can produce orders individually and in arbitrary lot sizes. 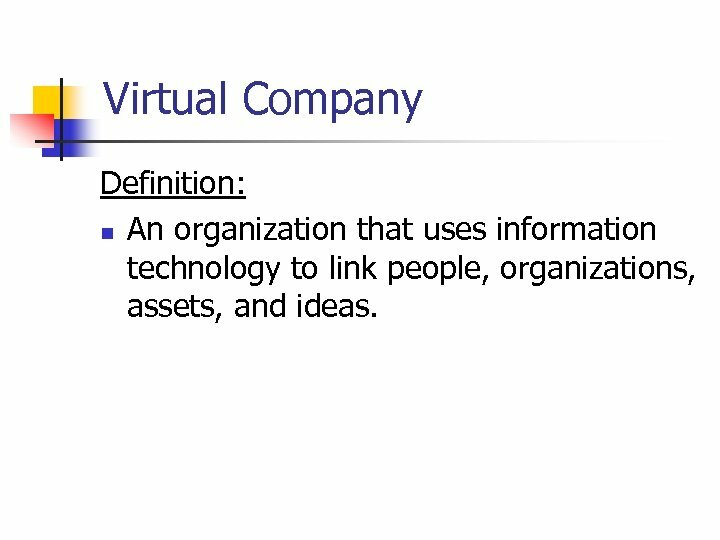 Virtual Company Definition: n An organization that uses information technology to link people, organizations, assets, and ideas. 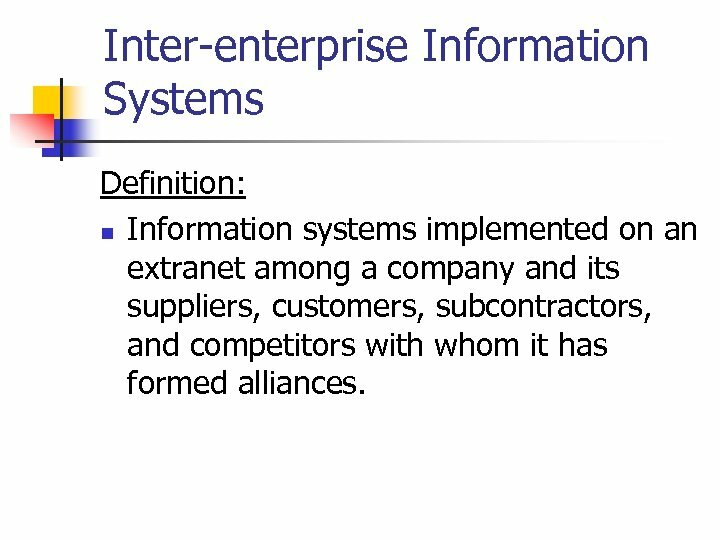 Inter-enterprise Information Systems Definition: n Information systems implemented on an extranet among a company and its suppliers, customers, subcontractors, and competitors with whom it has formed alliances. 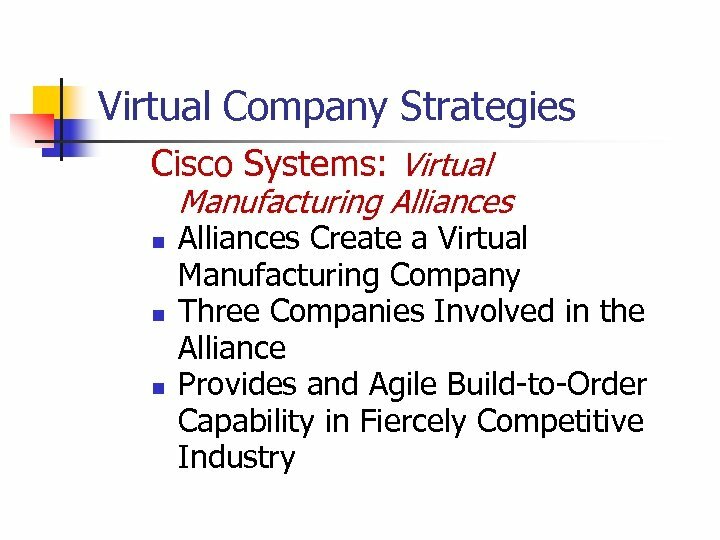 Virtual Company Strategies n n n Share infrastructure and risk with alliance partners. 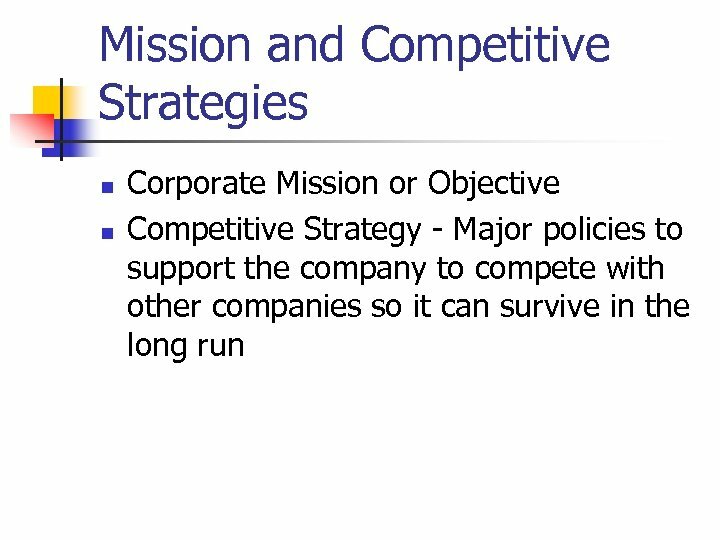 Link complementary core competencies. Reduce concept-to-cash time through sharing. 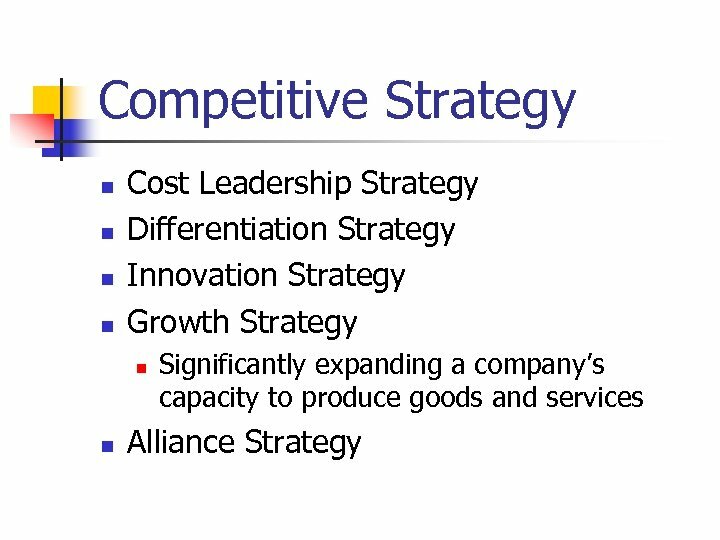 Virtual Company Strategies n n n Increase facilities and market coverage. 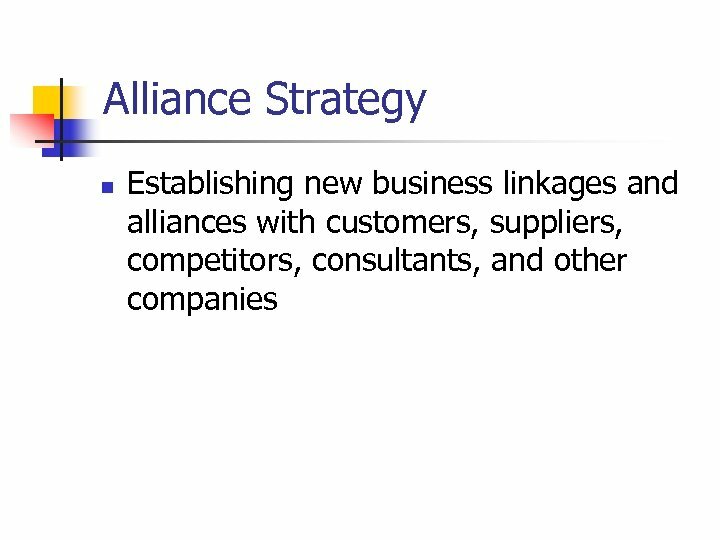 Gain access to new markets and share market or customer loyalty. 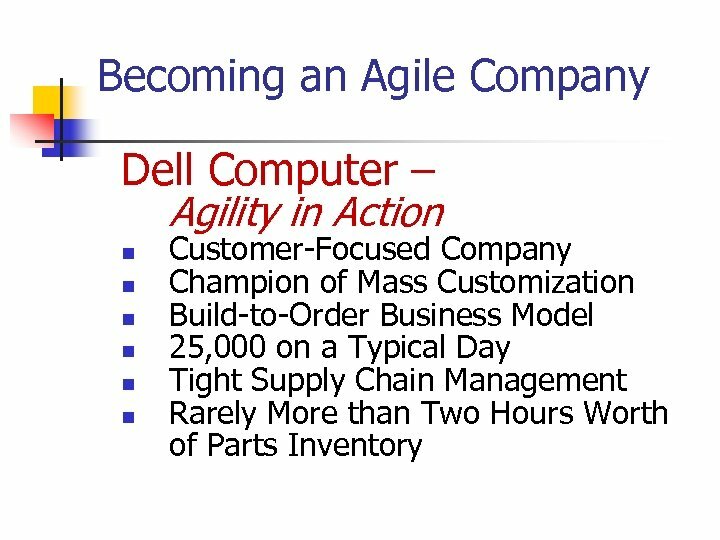 Migrate from selling products to selling solutions. 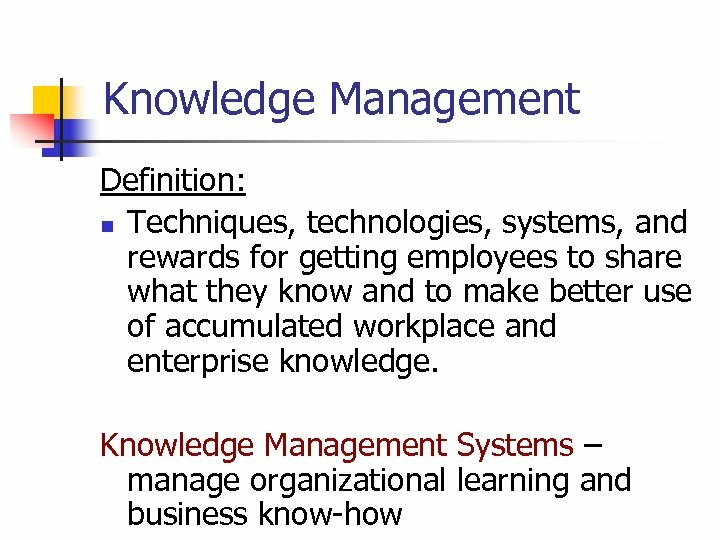 Knowledge-Creating Companies Definition: n Consistently creating new business knowledge, disseminating it widely throughout the company, and quickly building the new knowledge into their products and services. 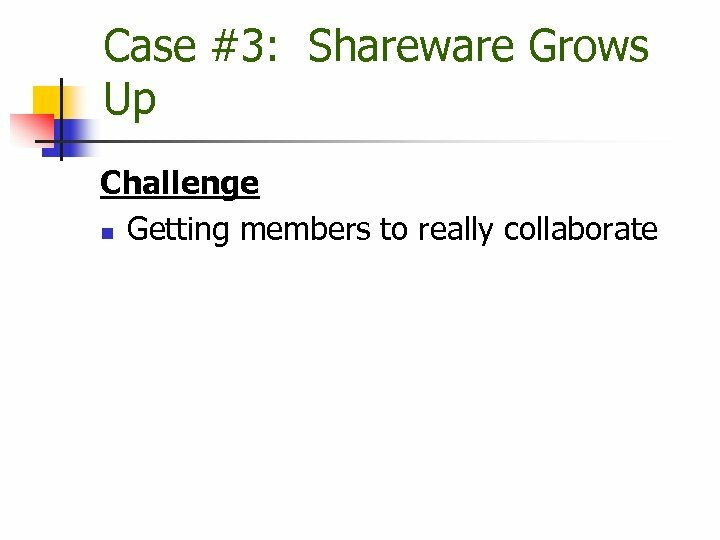 Case #3: Shareware Grows Up How a software cooperative works n Companies pay a membership which entitles them to use any of the intellectual property of the co-op. n Member companies will donate intellectual property, cooperate in adapting it for other companies, help troubleshoot problems and form subgroups to develop needed niche software for the library. Case #3: Shareware Grows Up 1. 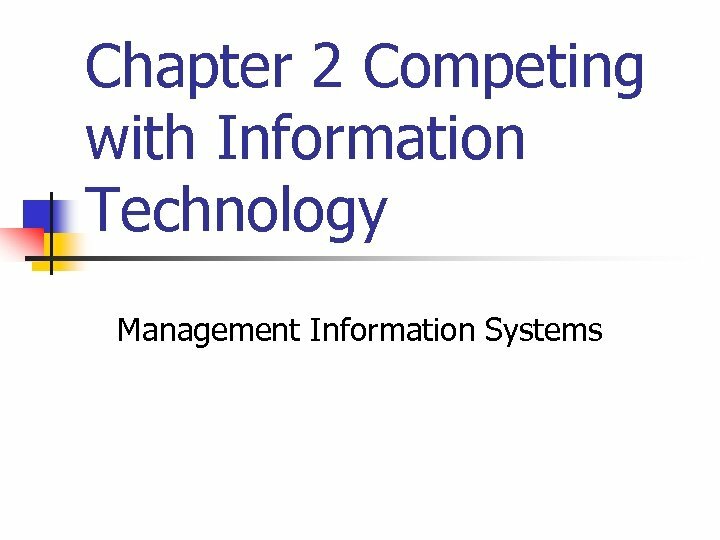 Organizations are constantly striving to achieve competitive advantage, often through their information technologies. 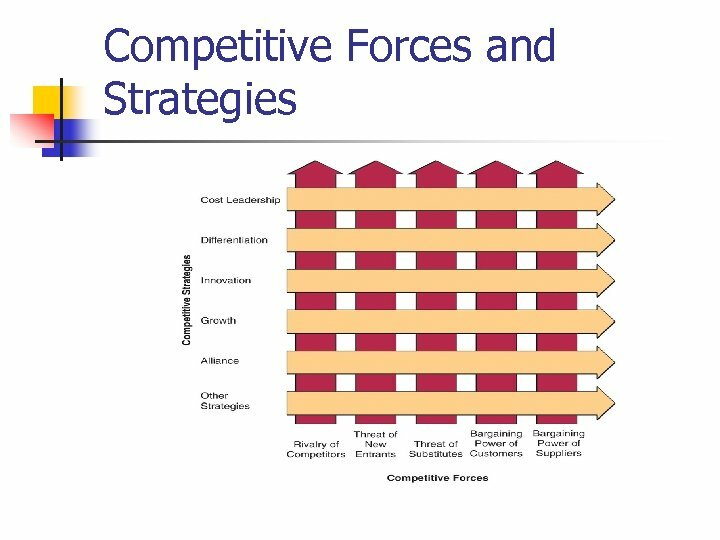 Given this constant, why does Hansen suggest that competition among members shouldn’t be an issue because the shared assets don’t bring competitive advantage? Explain. Case #3: Shareware Grows Up 2. 3. What do you see as the potential risks associated with the Avalanche approach? Provide some examples. 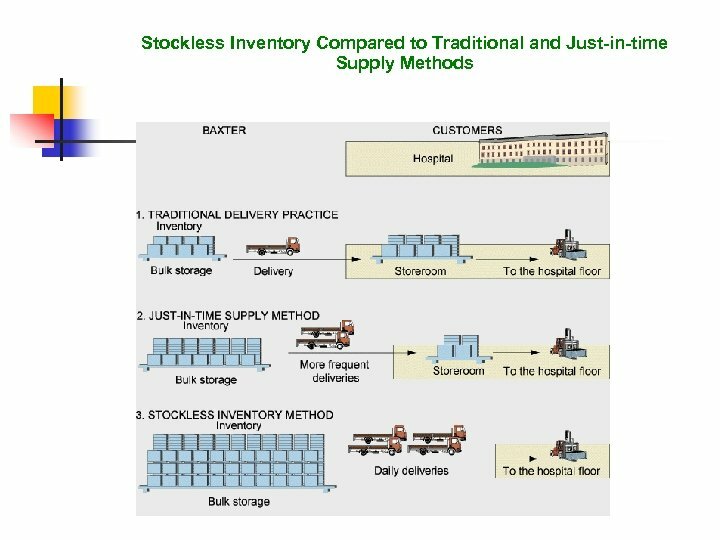 How could other companies apply the cooperative model used by Avalanche to achieve efficiencies in areas other than software support? Explain. 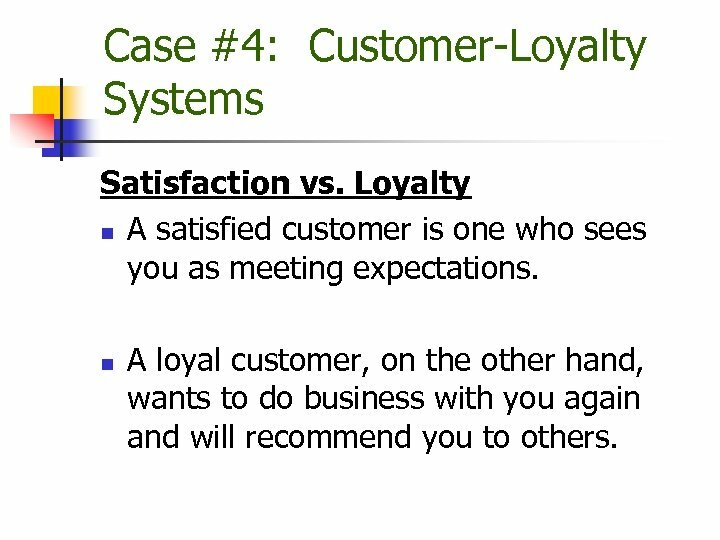 Case #4: Customer-Loyalty Systems Satisfaction vs. Loyalty n A satisfied customer is one who sees you as meeting expectations. n A loyal customer, on the other hand, wants to do business with you again and will recommend you to others. 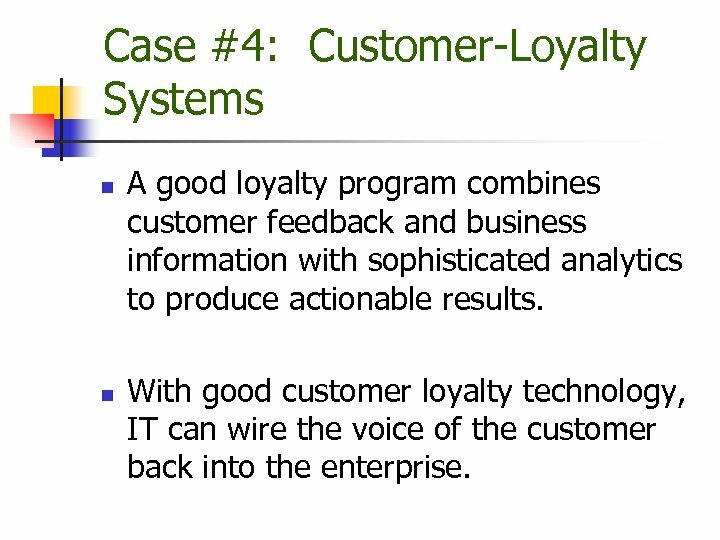 Case #4: Customer-Loyalty Systems n n A good loyalty program combines customer feedback and business information with sophisticated analytics to produce actionable results. With good customer loyalty technology, IT can wire the voice of the customer back into the enterprise. 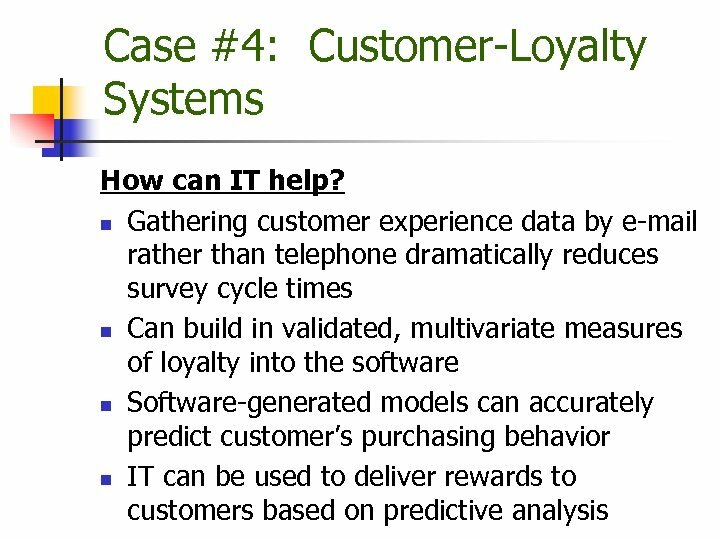 Case #4: Customer-Loyalty Systems 1. 2. 3. 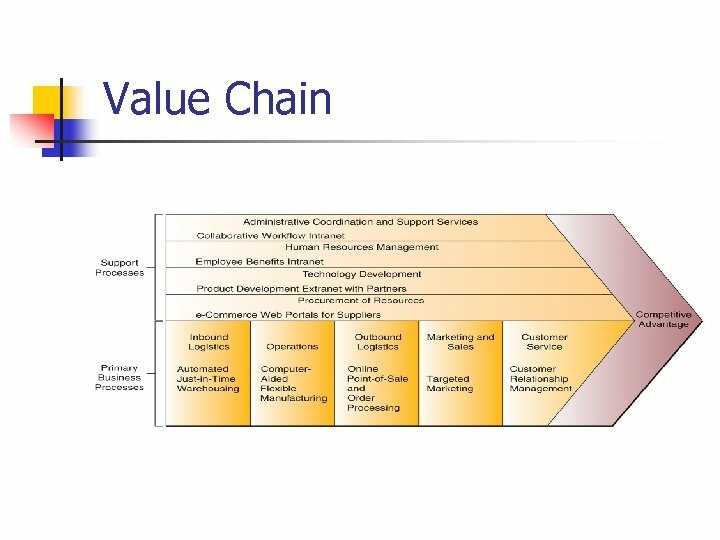 Does CDW’s customer loyalty program give them a competitive advantage? Why or why not? 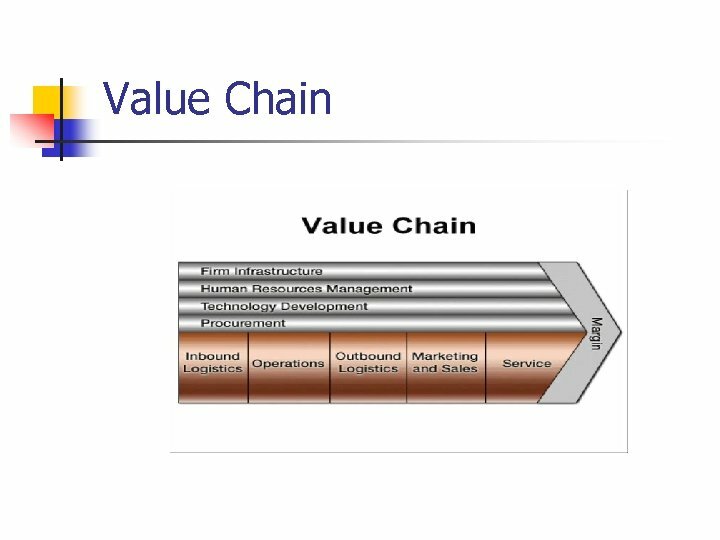 What is the strategic value of Harrah’s approach to determining and rewarding customer loyalty? 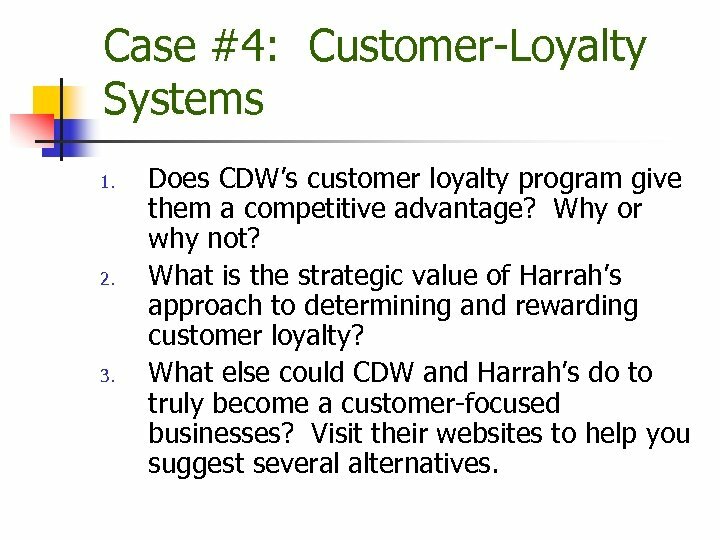 What else could CDW and Harrah’s do to truly become a customer-focused businesses? Visit their websites to help you suggest several alternatives.